Ms. Geddes is Senior Vice President of Asset Management for Ivy Realty. She joined Ivy Realty in November of 1999 and is responsible for managing and leasing in excess of two million square feet of office, industrial and medical space in the tri-state area and in southeast Florida. From 1999 to 2012, Ms. Geddes was Executive Vice President of Leasing for Ivy Realty and responsible for establishing Ivy’s Leasing Department, overseeing the portfolio’s leasing strategies and negotiating complex leases in addition to comprehensive management of select portfolio assets. 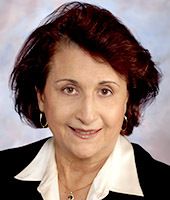 Ms. Geddes began her career in commercial real estate in 1984 working for the Troast Companies, overseeing the leasing and marketing of a 1.5 million square foot office and industrial portfolio and having an integral role on the development team where she was directly involved in the execution of new projects, including site selection, acquisition and the related governmental approval processes. Following her tenure with Troast, from 1996 to 1999 Marion served as Vice President of Leasing & Marketing for Alfred Sanzari Enterprises, overseeing a 2.5 million square foot portfolio of Class A office and industrial buildings. Ms. Geddes holds a Bachelor of Science degree from Montclair State University.